The 3-1 defeat proved to be the straw that buggered the camel into submission, leaving Gasperini with a pretty woeful record of one draw and four defeats in his first five competitive games. If that’s not a nailed-on ‘you’re getting fired in the morning’ face then I don’t know what is! For the record, the smart money seems to be on Claudio Ranieri stepping into the breach, we’ll keep thee posted. Looks like no one can break the Mourinho curse at Inter. @ds: Yes, I see it! @newcassel What language are you speaking? I’ve never heard a player being accused of mercenariness for staying at his current club. Are you a real Geordie or just playing up to the daft stereotype? it’s “Novara” actually. 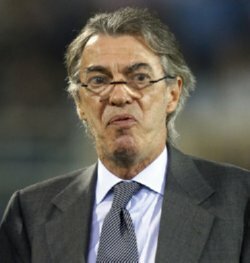 And Moratti is starting to act like Zamparini! Oops, thanks Kiara. Colossal F-F-F-FAIL on my part! That is the most outrageous music I’ve ever heard used to accompany a review of a match….electronic sax solo for the last ten seconds and all! I wonder if Inter fans are longing for the days of the Spanish waiter.